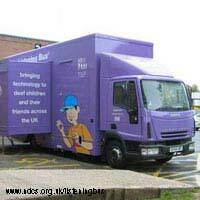 The Listening Bus is a National Deaf Children's Society project which has been going for almost 15 years. It was conceived as an idea to help get information and help out to people who needed it, in their own communities and the response from these people has been one of enormous positivity. The bus is, as the name suggests, a large van which tours the country helping to improve the lives of deaf or hearing impaired children. Because of its mobility and versatility, it can be taken to all kinds of locations, including those which might not have access to too many other services for deaf children. The bus is kitted out with all of the latest technology for deaf young people, be it ear hooks for helping hearing impaired youngsters listen to music on their iPod or flashing doorbells for those who are preparing to leave home and set up in their own place. It gives young people, their families, their friends, and even the healthcare professionals who work with them the chance to try out all of these various gadgets to see which ones may suit their needs and their lifestyles. The bus also stocks a wide range of publications about living with a hearing condition and how to improve lives and DVDs looking at a wide range of issues. The key thing about the Listening Bus is that it is not just aimed at deaf children. The equipment to try out may well be aimed at them, but there is enough information on board to keep a whole range of people busy. Parents in particular will find the Bus and its contents useful, and healthcare professionals who look after the child will welcome the opportunity to get to see the latest in technology up close. But the Bus also tours mainstream schools with the aim of greater understanding - by educating children who do not have a hearing condition about the ear, why some children have hearing problems and even little bits of sign language to better help them to communicate. The bus has a dedicated team which works on it to ensure that the advice being given out to people who visit the bus is as full and as accurate as possible. The people who man the bus are also able to give out site specific information, such as details of support groups and networks in the area they are visiting. They are also able to answer any questions anyone visiting the bus may have, and are especially used to taking questions from children and being able to answer them in honest ways which children will understand. People can request the bus to visit their school or community group if they have a particular event or need for the bus. Most of the work is done with the general community but some specialist groups have requested the bus in the past to enhance their community offering. Anyone coming along to the bus can also be sure that they will be understood, British Sign Language is used extensively, and even those who do not speak it may be able to get a crash course or at least learn a few words on visiting the bus. never heard of your service before but just had a frankly surreal encounter with some of your representatives at my front door, of the three only one spoke,at speed in different accents about random unrelated things before asking if i had children,i have three,one with complex disabilities,to which he said yhe other two mustve gottheir jeans from me not primark,this was rude enough but he then said the bus he was representing taught sign language to children but not the things he showed me with his hand,swearing,suggestive sexual motions,i have learnt makaton to help my family communicate and found him extremely rude and inappropriate and a bad representative for your good work. Looks like an exciting and interesting addition to promoting services for the deaf easily accessible and fun for the children, well done!